In addition to tokens and AYPE memorabilia, we buy and sell all manner of collectibles from Alaska, the older the better. Let us know what you have for sale, Native material, paper, photos, ivory, Tlingit silver jewelry. These are just a few of the categories. We will respond to every inquiry. Some of the items we have for sale are shown below. A magnificent, very large Alaska Eskimo ivory cribbage board. This board is 26 inches long and about 4 inches wide at the widest point, including the rails. Five nicely carved walruses line the board. Text inscribed on board reads "Nome City, Alaska." Original ivory pegs. This board was purchased in Nome around the turn of the twentieth century. $3,250.00 postpaid and insured in the USA. 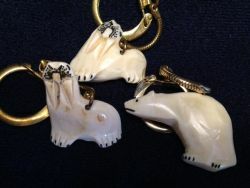 Three carved ivory Alaska Eskimo key chain figures. One polar bear and two walruses. Between 1 1/2 inches and 1 5/8 inches." $95.00 including shipping and insurance in the USA. Any questions or for more pictures, let us know. 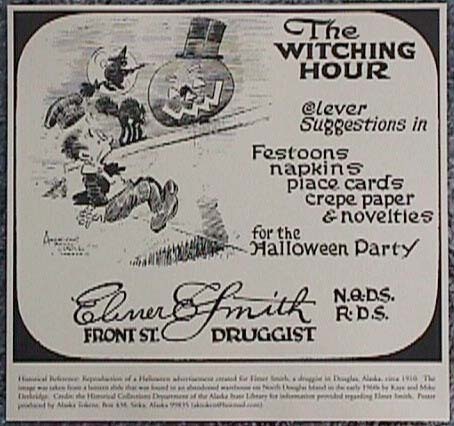 Small (12 x 12 3/16 inches) poster advertising a Halloween sale by Elmer E. Smith, Front St. Druggist, in Douglas, Alaska about 1910. This was reproduced from a lantern slide found in an abandoned warehouse near Douglas in the early sixties. Historical information is printed at the bottom of the poster. $9.99 postpaid in the USA. Wonderful 19 3/4 inch Eskimo ivory cribbage board with intricate geometric design. Unsigned. This board has had two legs, but one is gone. There is a little crack beside the hole where the other leg was, which doesn't detract from the lovely appearance of the piece. Write with any questions or for more pictures. $695.00 postpaid in the USA. 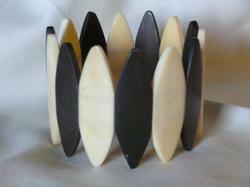 Alaska Eskimo Bracelet made of walrus ivory and baleen. 9 inches around and 1 7/8 inches wide, with 7 cream-colored ivory sections and 7 black baleen sections, strung on elastic cord. $150.00 postpaid in the USA. Alaska Eskimo ivory bead necklace, 21 1/4 inches long of reddish brown beads. 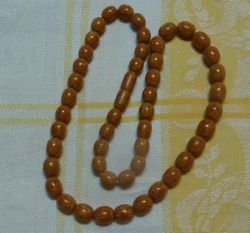 Beads are approximately 8mm x 10mm. Has hand-made screw clasp. Simple and elegant. $150.00 postpaid in the USA. 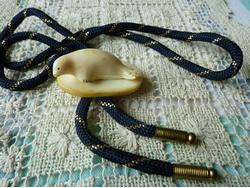 Alaska Eskimo carved ivory bolo tie. Carved seal lying on a 1 1/2 x 2 inch slice of walrus ivory tusk. $50.00 postpaid in the USA. Alaskan Tlingit silver bracelet with design of lovebirds (eagle and raven) by Billy Wilson of Hoonah, marked EJT sterling. $149.00 postpaid in the USA.